During its investor call today, Chase announced (via AppleInsider) that over 1 million customers have provisioned their credit and / or debit cards for use with Apple Pay. 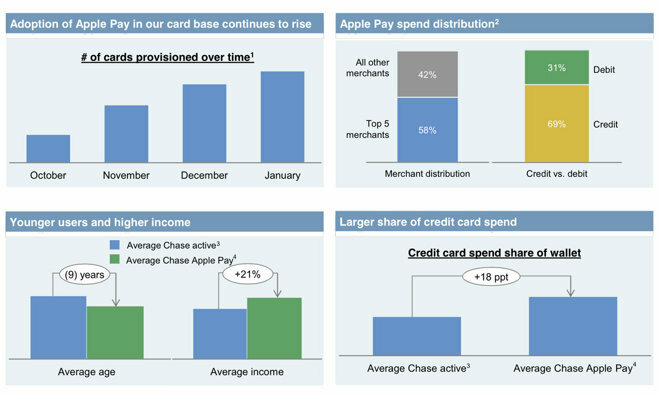 Additionally, the company provided a look at the demographics of its Apple Pay users. Eileen Sierra, CEO of Chase Card Services, said that its customers who use Apple Pay tend to be young and have higher incomes, with 69 percent of their Chase card Apple Pay transactions credit based. Sierra also revealed that the financial company has seen "good growth" in the number of its customers provisioning their cards on Apple Pay. Those customers have been using their Chase cards through Apple Pay at the top five merchants 58 percent of the time, with all remaining merchants making up the remaining 42 percent. While Apple hasn't provided adoption details on Apple Pay, CEO Tim Cook did announce in January that Apple Pay accounted for two of every three contactless dollars spent on American Express, Visa and MasterCard. Bank of America announced in January that nearly 800,000 of its customers were using Apple Pay, and point-of-sale suppliers have seen a massive increase in interest following Apple Pay's launch last October. Although Apple Pay is having early success in the United States, it has yet to expand past its borders. Reports indicate Apple is in talks with Canadian partners to launch Apple Pay in that country as soon as March, while Visa today announced it would launch tokenization in Europe in mid-April, paving the way for Apple Pay to expand into the continent. This is why Google Wallet is such a joke by comparison -- it has been "released" since 2011 and still hasn't achieved anything remotely close to what Apple Pay did in a few short months. I never understood why people like you say this, do you understand that all of the phone companies except TMobile blocked their application? Do you understand that you can't get a foot in the door if they keep it locked and guarded 24/7? Google has had four years to go around those problems that apple has shown they can do. Apple pay doesn't rely on the carriers, that is Google's fault and failure. If you can't get your foot in the door, find another door. That's Google's fault for putting themselves in the position of being at the mercy of the phone carriers. Apple hasn't allowed carrier politics to influence the iPhone since it was launched. Verizon wanted to load iOS with their own bloatware and Apple said no. There was a day when having a computer at home was a luxury and then the day came when it became a necessity, even for the computer illiterate (banking, tax returns, on line shopping, keeping touch with family, etc). I can't help but feel that the smart phone is maturing faster from luxury to necessity especially when I see how well Apple Pay is doing. Loved by all. The consumers, the banks and the retailers. This is the killer App that makes owning one essential. Yow... the pure defensiveness in your post is scary. Instead of concentrating on praising Apple for their good job, you have to immediately bring up their competition and squeeze in a jab. Even though Google Wallet's overall adoption is not the fault of Google at all, but the fault of the cell phone carriers who made every attempt to block it for the last four years. Android's success seems to affect you in a very personal way, so much you feel you need to lash out at them unprovoked. It's very obvious, you may want to dial it back a bit. I know this is a Mac fan site and all, but try to show a little maturity. Oh, of course it doesn't. Market share only demonstrates Android's overall success. Its an old example but Ford vs Ferrari. Clearly one is better than the other even though Ford market share is significantly higher. Time and time again its been shown that iPhone users spend more on apps and services which is why they are targeted first by developers instead of android users. Should success be measured by how many people have androids but don't use them for anything? Apple's revenue is at a worldwide record high (with smaller market share). And Android phone manufacturers like Samsung are tanking. Does making little profit constitute success in your book? Again another misinformed message from someone that doesn't understand why Google didn't have the success apple is having. That's okay, APPLE IS AWESOME! A lot of that is mobile carriers and banks blocking it. Google was able to get only one carrier partner and only a few bank partners. Eventually, they gave up on getting bank partners and decided to have Bancorp Bank (the largest issuer of prepaid cards) issue them prepaid cards, and Google then charges your real card. This system actually means every Google Wallet transaction results in a loss for Google - not exactly a reason to widely promote it. It also means that every sale technically goes to Google, raising questions about things like disputes and purchase protection programmes. It's great for McDonald's, but not so great for other categories. Also, American Express does not recognise category bonuses on Google Wallet purchases (though Visa/MC do) - this has to do with how Google codes the transactions. Google Wallet is great for what Google can do on their own. Apple brought in bank and network support. That is the biggest thing Google is buying with the Softcard assets they have picked up - support from several large banks and payment networks. No matter what angle you look at it, Apple took all the appropriate steps that made them successful, Google didn't. McDonald's is the best restaurant in the world then. Yep, makes sense going by market share.